Arts Reverie is an exquisitely restored 1920’s haveli in the heart of Ahmedabad’s old City. It is run as a centre for creative arts professionals. In the heart of the bustling city this special guest house offers a unique home-stay experience. It fosters international exchanges, a place where visual artists, writers, poets, musician, dancers, playwrights, visiting curators, academics, journalists, photographers, cultural study experts, architects and other creative professionals can stay. Arts Reverie is set in the heart of a traditional pol or enclosed neighbourhood. The house is a ground plus two storeyed structure with a floor area of 325 sq. mts. It represents the typology and evolution of traditional havelis with a grand facade with elaborate stucco work and decorative pediment. Originally belonging to a Jain jeweller, the restoration of the building was carried out by the Ahmedabad Heritage Centre as part of the Indo-French Cooperation Project. Traditional elements co-exist with modern conveniences such as a wire-free environment in contemporary interiors. ‘Bhung’ or mud hut a traditional construction in Kutch is an engineering wonder. Here are the mud houses or bhungas and glipses of people of Kutch.These traditional circular homes withstood the devastating earthquake (2001). They are also considered cyclone proof. They can be constructed with local material. 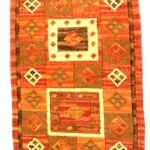 The colourful and one of the extremely rich in crafts region of Gujarat (India) is Kutch. 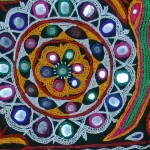 Many communities and tribes in this region have their own distinctive styles in textiles, embroidery and handicrafts. 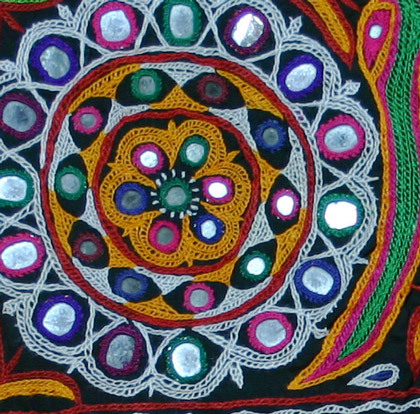 Each community and tribal group has its own lexicon of motifs and embroidery stitches. Rabaaris are the ones who decorate the insides of their mud-and-thatch huts with ‘lippankam’ or mud-mirror work; the Bharwaads are seen in their exquisitely embroidered dresses and clothes; the Meghwaals decorate the exteriors of their mud huts with alluring patterns; the nomadic Jaths whose subgroups include the graceful Fakirani Jaths, live in huts made of coloured reeds. And you can see a group of Jath women walking along the road in their brightly coloured and beautifully embroidered costumes. What makes the `bhungas’ so strong? Their circular design and the steely mesh of mud plaster and twigs make them resist any wind pressure and quake. 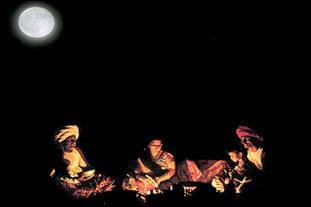 The `bhungas’, which ‘even a king would envy’ for its elaborate design and artistic elegance, have a light dome-shaped bamboo and thatched roof and a circular wall plastered with mud, twigs and dung. Their thick walls keep the interior cool when the temperature rises to 46 degrees celsius in summer and warm when it drops to two degrees in winter. 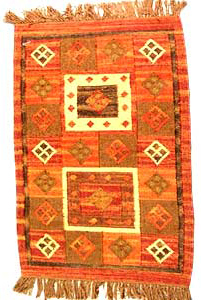 Above image is part of permanent exhibitionin in the Museum für Völkerkunde zu Leipzig in Germany. 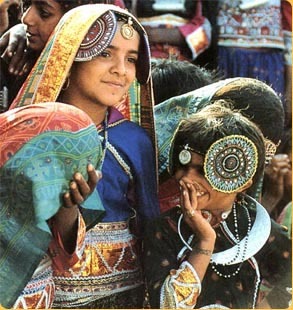 I had to bring these enduring images of Kutch & Bhung before I do a post on lippankam and other crafts!